GrrlScientist reviews Bottomfeeder: How to Eat Ethically in a World of Vanishing Seafood by Taras Grescoe. Mark Bittman: A Seafood Snob Ponders the Future of Fish. And "time is running out for Japan's obsession with the bluefin tuna." 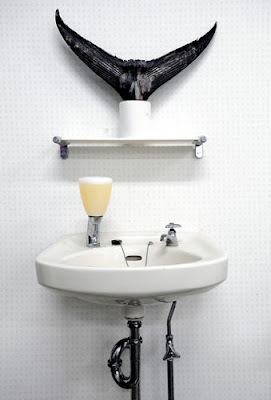 Image: Bluefin tuna tail above a wash basin at the offices of the fisherman's union in Oma, Japan.